Milan's western zone is its greenest district, with three large parks. It is also the home of one of the world's most successful football teams, A.C. Milan. The San Siro football stadium gave its name to this residential district in western Milan. It is marked by modern condominiums crowned with rooftop swimming pools and adjacent to gardens and tennis courts. The many luxury cars seen here suggest that San Siro is a place for wealthy Milanese. Since San Siro is close to the French and the International schools, it is also favored by expatriate families. The area has several parks, including Parco di Trenno, Monte Stella, and the nearby Bosco in Citta. 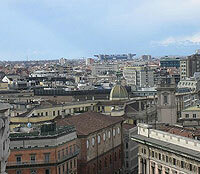 San Siro has good access to the city centre, which can be reached from here in about 30 minutes.